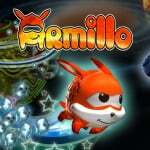 There's been a lot of great eShop content as of late, but not many examples have been in the works for as long as Armillo, which was first announced way back in 2011. Now that it's finally here, were those years in development well spent? In Armillo, you take the role of the titular character, a space armadillo, who is living life carefree on his home planet when it's suddenly attacked by the evil Darkbots. It's the tried-and-tested video game story — your friends get kidnapped, the bad guys try to take over the world, and you've got to set things right. The game comes quite close to resembling other games, but in the end feels quite unique. 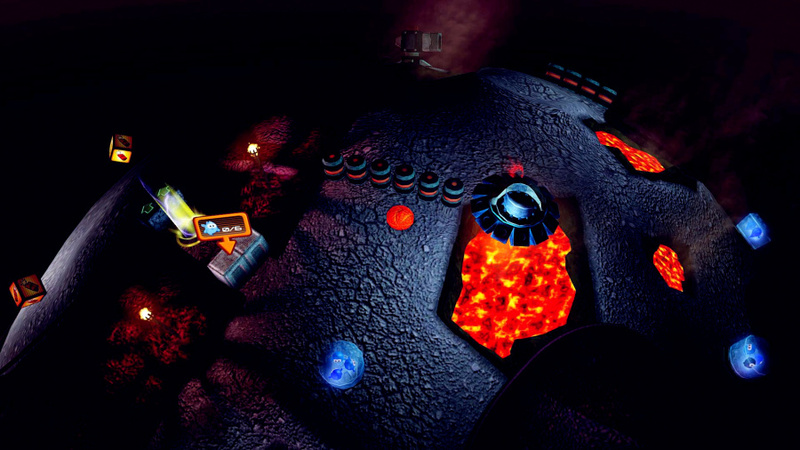 During gameplay, you get to roll and jump around small, spherical planets, similar to Super Mario Galaxy, but there are rails and walled off paths all around meaning that you can't just go wherever you please. 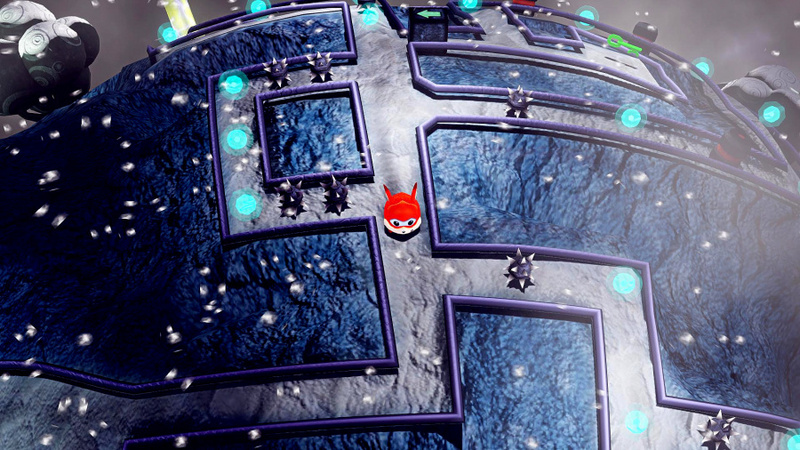 Some levels have ramps, boost pads and tracks suspended above the planet that almost make you feel like Sonic the Hedgehog when speeding through, in addition to Armillo himself having a Sonic-esque rolling dash attack. Mostly, though, it's not a super fast-paced game, as there are plenty of puzzles and challenges that need to be figured out; you will only encounter the occasional section of platforming. 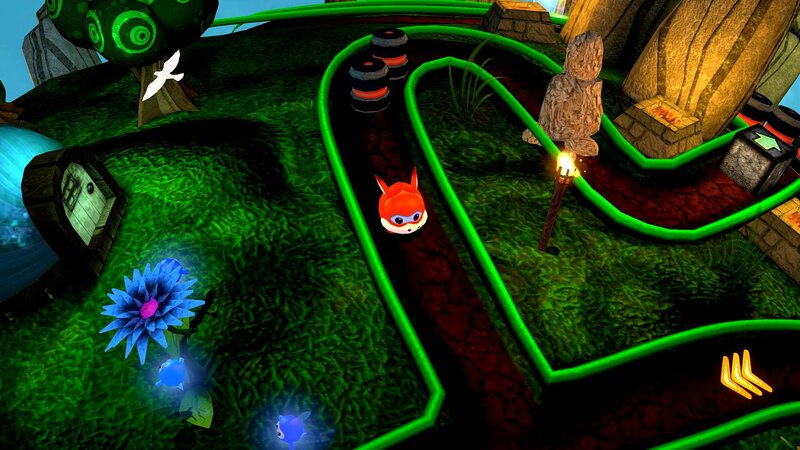 Your main goal in most of the levels is to rescue the trapped Critters, who will in turn open paths for you and eventually lead you to the exit. Many other elements also come into play, including the usual locked doors and matching keys, but also an alternate dimension in which you can only survive for a limited time, machines which change the weather, and many more. Once you get the hang of things, and especially when replaying stages, the game really starts to shine — the slightly linear layouts work in its favour, preventing aimless wandering and just presenting you with challenge after challenge. Of course, at the start of the game these tend to be similar, but as you progress and keep encountering new features they'll get more and more varied and fun to figure out. Eventually, almost every single level will introduce something new, keeping things fresh all the way through. While it's not particularly hard at first, with the first world mostly serving as a tutorial, the game gradually ramps up the difficulty; by the end it gets quite challenging, especially if you're the type not to leave anything behind. Luckily, you'll quickly have access to a shop where you can spend your collectibles on upgrades such as increased max health, more time in timed sections, and more. This even leads to some optional backtracking, as you can buy abilities that let you access entirely new areas that you couldn't reach before in previous levels. In addition to the many collectibles, it's possible to find and unlock a bonus stage in every single non-boss level, which can then be accessed from the level select screen, with a fourth unlocking if you beat the first three in a world. These feature completely different 2D gameplay, with an added double jump and a fairly strict timer, meaning you'll have to speed through them if you want to make it to the end in time. The aforementioned boss battle stages are, when compared to both the normal and bonus levels, pretty simple and short, and tend to just have you moving around a level while dodging the boss's attacks before finding and retaliating with a particular weapon. This experience is quite long, meanwhile, with five worlds featuring four stages each, and an equal number of bonus stages. If you decide to go for 100%, the later normal levels can take upwards of 10 minutes to complete, as they have a lot of collectibles and secrets to find. All of the levels, bosses and bonus stages included will also award you with medals based on your score, which can also result in many replays to attain that coveted gold. Overall, there's a lot of content here. In terms of technical prowess this has to be one of the most impressive eShop-exclusive titles yet, with beautiful levels and a rocking soundtrack, which turns into somewhat Commodore 64-like chiptune metal when playing one of the bonus stages. One odd thing, however, is the framerate, which seems to take dips in places where you wouldn't expect it. In one particular level where you change the weather and make the entire planet look different within a second, nothing happens at all, but then in another which just has a small group of enemies on-screen at the same time, it takes a nosedive until you've eliminated the lot of them. It's not game-breaking, but it is a little surprising. It's been a long time coming, but Armillo has absolutely been worth the wait. A large amount of content, regular new gameplay additions that ensure the game doesn't get stale, a full second set of levels with completely different gameplay, and high replayability have all come together to create the newest must-have eShop title. The occasional framerate hiccups are a downer, but don't detract from the overall experience. Pretty fair review. I got it last night and enjoyed what I played. I love this game, favourite indie game on the U. Aside from several technical issues I have no problems with the game. Good review. I'll be downloading this tonight I reckon. If you put aside the technical stuff (a few glitches, framerate stuff)....it's a very fun game for $6. Nintendo World Report also gave this an 8 out of 10. 1,001 Spikes, Shovel Knight, Ittle Dew, Guacamelee, Armillo, I've got a lot to play this summer! Could not help but notice that Nintendo Life is part of the Special Thanks during the credits. Cool stuff. Well, that sounds much better than I would've ever expected! I guess I'll give it a shot! To me, this review of "Armillo" confirms that "Scram Kitty and his Buddy on Rails" was treated really unfair in the NintendoLife review (by the same reviewer). I'll continue to play Armillo when the frame rate patch arrives. I think it's a really fun game, really pretty art style & quite a good deal at its current price. Glad it turned out as fun as I had hoped. I'm surprised by the lack of reference to Pacman when talking about sources of inspiration for the game. The trailers feature a lot of maze-running and dot-grabbing. Is it not a fair statement to say it takes a little from the arcade original, albeit in a 3D environ? I haven't played it yet, so it's an honest question, not a suggestion. Somehow, I have the impression this is in part what the last stages of Bit Boy!! was supposed to be like... even though I've never played any of the Bit Boy!! games. Will download but kinda wanna finish Shovel Knight and Scram Kitty before I do. Hmm I wasn't interested in this game before I read this review. I may just reconsider since it looks like it could be alot of fun! When does the promotion expire ? How much space does it use ? Sega hire them to make your Sonic game! @unrandomsam The promotion price is until July 24th, according the the European eShop. My Wii U says the game is 1345 MB installed. Btw, make sure to play Armillo on a big good sound system. The sound design is fantastic. I hear they're working on a patch to fix the framerate issues... may hold out on buying until that gets done. Buy it while it is on sale, and play it when the patch arrives. Personally I will play it as is, and replay it when the patch comes. for 6 dollars i got to get it. Mario Kart 8, Pushmo, Shovel Knight, and Armillo! Nintendo gamers won't have any droughts this summer! I got this after reading the great opinions on Miiverse. Now I need to free some space on my WiiU (or maybe to buy an external hard drive...) to download more great games! So glad this is finally out. Picked up last night. Graphics look rough but game looks fun. Whilst I downloaded Guacamelee last night, I was waiting on the review for this as my backlog is insane at the moment. Think I'm sold though. @MegaScizoig is on sale now why wait? It will actually be more expensive in a couple weeks. As for the review I would say that it is spot on. Actually one of the more thorough reviews that caught how important the shop and going back to old planets is. I got the opportunity to beta test the game and played quite a bit of it. Definitely a joy. You will see how much more technically advanced it gets in the later stages. Good to see quality indie titles flocking to the Wii U's eshop! Please review the bombing bastards soon! I'm really interested in the game but don't know whether it is actually good or not! the developer said theyre fixing that framerate issue. shame its actually in the conclusion here when its not gonna be true soon. Just so you know, this IS the sale. The game is running at an introductory price of $6 to appease us for the delay (at least I assume that's why). I'm really loving this game. I think it's definitely in the top-tier of 3rd party digital releases on the Wii U eShop, and doesn't seem out of place next to gems such as Shovel Knight, Toki Tori 2 and Scram Kitty. Question though. I can't seem to unlock the bonus 2D stage for the first level in the game. What gives? I get every single orb in the stage, I find the green thingymabob on the moon stage, yet no access to the first 2D stage...? @JaxonH You need to get the upgrade that allows you to break down those black brick walls. You get it in the shop once you reach World 2-1. This helps you reach new areas in worlds that you couldn't reach before. well, I picked this up last night...I haven't had a chance to play it yet...but I am loving the catalog of eshop games being released. Welp I decided that 6 bucks for a quality E-Shop title sounded like a really good deal, so I decided to get it! Looking forward to trying it out later! It's pathetic how many people are complaining about 'PS2' quality graphics or the odd framerate drop on Miiverse. It's currently only £4 on the E-shop and it's a great little game for that price. I've played plenty of indie/download games that cost twice as much and were a lot worse, some people really just want to complain for the sake of it. Oh wow, I actually already have that upgrade. Didn't know I'd need to backtrack with abilities, so thanks for clearing that up! No doubt. It's actually one of the better looking digital games on the eShop too. I mean, what do people expect? It's a $6 download game. It's not gonna look like Mario Kart 8. Even with that said, I think it looks fantastic. Definitely looks good enough that graphics don't detract from gameplay, as they do with many other indie games. I'ma go to Miiverse right now and post just how much I love how this game looks. Sounds impressive, but I can tell from videos that it's definitely not for me. The movement looks awkward and the game seems too slow-paced for my tastes. Tried playing the first stage again with the upgrade that allows the black blocks to break, but still couldn't get the 2D level from it. Lovin' the user comments here - thank you for your support and words of encouragement. You guys rock! Thank you for YOUR support! Armillo's a dang good game- the soundtrack (especially the soundtrack), the gameplay, the characters, the story, the upgrades... I like it all. @YannEA Thank you for supporting our console! You really did a great job. Armillo is so fun, immediate but still pretty hard in later levels. It reminds me of some old school platformers on the N64 i loved. I'll look into it sometime in the future. It's always great to see quality titles hitting the eShop, and there seems to have been quite a few as of late. @ToxieDogg Hope those who complains about the graphics quality on Miiverse also recognize that the sound design of this game is better than almost any game available. Once the frame rate issues are resolved, this will great, IMO. @YannEA Thanks for your hard work on this game! @YannEA Thank you for supporting the WiiU. Hi there. Thanks for the game and thanks for stopping by to listening to honest feedback directly. It is good to hear that the team is working on a patch for the framerate issues. Keep it up! Thank you for bringing such a fun game to Wii U. I love the sound, level and character design. It "feels" like a sonic game with boosts and dash mechanics but it has great controls. I am enjoying the game a lot so far. Why are you guys SO AWESOME ?!? Thanks so much for the feedback - I'm reading everything! Ping me in twitter if you want an immediate response! "If I could make just one suggestion (just my own 2 cents), the zL and zR could perhaps be mapped to L and R to act as alternative buttons for camera control. " We kicked this idea around a lot and because your fingers rest there (ZL/ZR) 90% of the time, the camera would accidentally get turned most of the time. Because the auto cam works well 95% of the time this would actually make the gameplay really horrible due to bad camera. We decided since the camera is very different than an fps and we also didn't have a setting for button mapping, that making the camera rotation hard to reach would be the lesser if two evils. Thanks for explaining the rationale behind the camera and buttons. I like the camera in the game and only have to adjust it occasionally when I am peaking around in levels, so it feels good to me. It is nice to see developers interacting with fans. Now for the real question, where can I get an Armillo plush that I see in your developer videos? So cute. I don't have any problems with the camera being where it is. And I want to congratulate you for having that early bird discount. A brilliant way to make people buy the game in the first weeks, as opposed to waiting forever for a sale. Still the game seems to be a steal at its regular price. Well, I didn't really look into this game but thought the art style looked nice. Nice to hear it's a fun game. Good review. Have been keeping an eye on this one for awhile, really liked the look of the game and bought it day one have to say it's a great game with a fabulous soundtrack, in fact I would have paid £4 for the soundtrack alone. Above is a good review of the game, all I can say is if you are a little interested it's definitely worth the cash and your time. Oh and yes the frame rate is a little bad in places but not interrupt the gameplay well not yet anyway. @PinkSpider: I shudder to think of how the game must run on a USB drive, then - I don't have one and even then the framerate occasionally plummets. Sounds good. May download in the future. I watched the video for this on the eShop and thought it looked pretty good, now after reading all the positive reviews and comments I am definitely gonna get it!